We’d love your help. Let us know what’s wrong with this preview of Lord, Change My Attitude by James MacDonald. To ask other readers questions about Lord, Change My Attitude, please sign up. This is a must read for everyone even if you don't think you need to read it. You do. I listened to the audio book. This was a time when I really needed to be challenged, and this book helped me to do that. I honestly do feel like I've grown closer to God and even fixed some of my other relationships. The audio that I listened to (mp3) was very clear and the narrator had an easy voice to listen to, and was also very easy to understand. The principles outlined in the book were very helpful. Change your attitude, change your life. We're very good at explaining why we're unhappy: bad job, bad relationships, bad luck. But there's probably a better reason: bad attitudes. 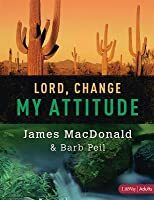 In Lord, Change My Attitude, James MacDonald shows us just how much our attitudes affect our lives. One of his bestsellers, this book is classic James: It's clear, it's inspiring, and it packs a punch. Drawing from the experience of the Israelites who grumbled through the wilderness, MacDonald shows how bad attitudes rob us of joy. Coveting, complaining, and being critical are not what our hearts were made for. They were made for thankfulness, contentment, and love. Is your heart straining under the weight of a bad attitude? Don't read this book if you're looking for a quick fix. Don't read this book if you're unwilling to change. Read it if you're ready for a serious, inside-out attitude adjustment. Its not all that hard to experience defeat to such a magnitude that you just hate life, in general. That defeat can grow over into your spiritual life by way of bitterness and that bitterness can turn into down right anger. James MacDonald, is an awesome minister and speaker and he uses what he has learned to guide us in the way we should go. God doesn't like murmuring and complaining. Lord, Change My Attitude Before It's Too Late, is not for the faint of heart. James wants us to look long and hard in the mirror at ourselves. This book is not a quick fix, it is a must fix in order for us to grow in God and finally receive the blessing that He has always wanted to gives us. Using the Israelite's as an example, the author shows us how badly they messed up and what God did to turn it all around. Wow! this book is eye opening and could explain a lot of why we go through what we do. I love reading the author's insight into a very touchy subject for my family and me. There is a study guide also included in the book for further study or for a small church group. This was an amazing book! Filled with so much wisdom and insight this book was an outstanding read and was such an excellent reminder that our attitude makes such a huge difference in our life. Drawing heavily from the story of the Israelite and their lousy attitude while wandering in the wilderness. This book draws some strong parallels between the Israelite and our own attitude this is very though provoking and sticks with you long after then final pages. I received a copy of this book in exchan This was an amazing book! Filled with so much wisdom and insight this book was an outstanding read and was such an excellent reminder that our attitude makes such a huge difference in our life. A great bible study book! As always, James gets to the heart of the matter and pulls no punches! Listen to his sermons for a great reality check on how you are living! :) It is much more fun to read his book when you can hear him speaking the words in your mind! Lord, Change My Attitude: Before It's Too Late by James MacDonald uses the experience of the Israelites grumbling in the wilderness to help us recognize and learn from God's attitude toward our attitudes. This book starts with an invitation and an introduction. The introduction is mandatory, as James states repeatedly. This is where he takes the time to explain his approach and lay out a blueprint for the work you're going to accomplish. 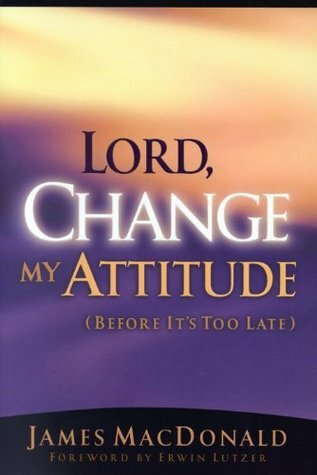 The book itself is divided into 10 chapters, to be read in Lord, Change My Attitude: Before It's Too Late by James MacDonald uses the experience of the Israelites grumbling in the wilderness to help us recognize and learn from God's attitude toward our attitudes. This book starts with an invitation and an introduction. The introduction is mandatory, as James states repeatedly. This is where he takes the time to explain his approach and lay out a blueprint for the work you're going to accomplish. The book itself is divided into 10 chapters, to be read in pairs. The first chapter of each pair covers the attitude you'll replace and the second chapter shows you what attitude to replace it with. At the back of the book, there's also a study guide with Bible readings and questions laid out to help you on your journey. Lord, Change My Attitude: Before It's Too Late focuses on five negative or "murmuring" attitudes to replace with praising and glorifying attitudes. Why not just cast off the bad attitudes and call it good? Because if you leave a vacancy, something will move in to fill it. And we want that something to be an ally to help us get closer to God. The attitudes addressed in this book (and the ones that you put on in its place) are as follows: complaining (thankful), covetous (contentment), critical (love), doubting (faith), rebellious (submission). Even if you don't feel like one of the relates to you (for me it was covetousness), read the chapter. Really let the storyline, definitions, and examples sink into you. Most of these feelings cover much more area and flow much deeper than we think they do. This book is very intense and deep. James walks you through Bible excerpts, definitions, modern analogies and comparisons, personal stories of both failure and triumph, focal questions, action plans, and prayers to help you get closer to God. I'd recommend it to anyone who realizes their attitudes aren't consistent with the path they want to be on, and are serious about making a big change for the better. As stated on the back cover, "If you're looking for easy answers or a quick fix, this book isn't for you." 5/5 stars. Attitudes are a pattern of thinking formed over a long period of time. This is repeated throughout the book, over and over again; and it can't be said enough. The book covers 5 attitudes that we all struggle with, certain attitudes more than other. Each chapter covers an attitude and then is followed by a chapter of what to replace it with. ...With an Attitude of Contentment.
. Attitudes are a pattern of thinking formed over a long period of time. This is repeated throughout the book, over and over again; and it can't be said enough. The book covers 5 attitudes that we all struggle with, certain attitudes more than other. ...With an Attitude of Love. ...With a Attitude of Faith. ...With an Attitude of Submission. (Page 38-kind of paraphrased) "Maybe you're thinking to yourself that complaining's not a sin. Who am I really hurting....you're hurting yourself! Complaints usually always lead to anger, bitterness and even depression." Honestly, has complaining about your job or a person every made you like them more? No one wants to admit that they are in control of their attitudes. It's so much easier to blame something; How can I be thankful when I work so hard and have nothing to show for it...how can I not be envious? My house is tiny....or even, I just woke up on the wrong side of the bed, I'm just in a bad mood today. When you start looking at your attitude like something you decide it'll change your life. Yes right now I want to complain this or that, but I'm choosing to be thankful. Yes, a big house would be nice, but I own a beautiful small house...It's hard, but look at a bad attitude like a bad habit. Get rid of it! I loved this book. Like, was constantly underlining and want to buy it for friends, love. I am excited about this book! I hope many people will read it and really take the time to examine their hearts and attitudes about life! I know my life has been getting better since I really deeply examined my attitudes about everything and repented of my bad and selfish outlook on life! This book is an in-depth examination of the motives of our hearts. Although deep, this book is also easy to read because the author, James MacDonald has such a special and Change your attitude, change your life. I am excited about this book! I hope many people will read it and really take the time to examine their hearts and attitudes about life! I know my life has been getting better since I really deeply examined my attitudes about everything and repented of my bad and selfish outlook on life! This book is an in-depth examination of the motives of our hearts. Although deep, this book is also easy to read because the author, James MacDonald has such a special and humble way of explaining things to people with clarity and compassion. Because of the author's openness and friendliness, this book has some humorous and very relatable points as well. I do recommend this book for men and women, young and old! The length of the book might intimidate younger readers but I encourage them to take it a chapter at a time and really think on the Biblical wisdom and go through the discussion questions. This was my first time reading a book by James MacDonald and it definitly won't be the last. I loved how James MacDonald explained the different attitudes of the heart. He explained them very well and used lots of Scripture to support his points. I also loved that he had a prayer at the end of every chapter. It's like he took the words out of my heart and put them on a piece of paper. 4. .. This was my first time reading a book by James MacDonald and it definitly won't be the last. I loved how James MacDonald explained the different attitudes of the heart. He explained them very well and used lots of Scripture to support his points. I also loved that he had a prayer at the end of every chapter. It's like he took the words out of my heart and put them on a piece of paper. Lord, Change My Attitude Before Its Too Late: Before Its Too Late is the best book title ever. If that was the title of Evermore, Evermore would have legit been the next Twilight. If Brian Dunkleman would have written a book called Lord, Change My Attitude Before Its Too Late: Before Its Too Late, he never would have been fired from anything for the rest of his life and he would have had excellent dental. "Lord, I do not have the strengh to follow You. Forgive me for thinking that while I needed You to save me, that I was going to change myself. I'm asking You to flow Your grace and strength into my life. Every week of failed attempts reinforces to me how desperately I need Your help. I invited You to fill me with Your Spirit and give me the strength that I need for every difficult circumstance and person I encounter. I ask that Your grace would help me put off all sinful attitudes and put on rig "Lord, I do not have the strengh to follow You. Forgive me for thinking that while I needed You to save me, that I was going to change myself. I'm asking You to flow Your grace and strength into my life. Every week of failed attempts reinforces to me how desperately I need Your help. I invited You to fill me with Your Spirit and give me the strength that I need for every difficult circumstance and person I encounter. I ask that Your grace would help me put off all sinful attitudes and put on righteous ones in their place. I declare with gratitude that I trust You will change my attitudes, and that it's definitely not too late! In Your name, Jesus, I pray. Amen." This is an excellent book that addresses the bad attitudes of complaining, coveting, being critical, doubting, rebelling. It gives good practical advice on 5 corresponding good attitudes with which to replace the bad ones. I got a lot out of this book. I like the idea of replacing one attitude with another and that he lays the book out the way he does. He does go on a ton of tangents though and is, obviously, very Christian. I think anyone can read the book who wants to change their attitude for the better, but just know that it relies heavily on the Bible and God. I wish he would have been MUCH more concise, but other than that I liked it. This book hits hard. I know a ton of people LOVE James MacDonald and I KNOW what he says is true, I just very often have a hard time hearing it...probably just me and an attitude adjustment that is needed, but I often feel scolded by James. That being said, this is a great book to read. I have a ton of work with my Doubt and Rebellious Attitudes and feel that I need to continue to reread the portions on FAITH & SUBMISSION...about 100xs a year. Pray for me as God works on me in these areas!! This book is written if a really easy to read format. It's like the author is actually having a conversation with the reader. It's set out wonderfully with bible references and quotations and even outlines suggested prayers at the end of each chapter. This was really helpful because it means you can pray about what you've just read and learned. It's a fantastic book and I will highly recommend reading it for anyone, but particularly for people who want to change their attitudes in a Godly way. This is one of those books you wouldn't buy unless you were honest enough to admit that you had an attitude problem... or you want to ask yourself some hard questions about if you do or not. And it delivers, for sure. This book was so convicting, challenging, but such a growth opportunity for me. Would totally recommend this book to anyone having relationship issues and wanting to take personal responsibility. This is one of those books that cannot be read through quickly for every page offers an opportunity for personal insight and change. If the reader desires to go to new levels in their spiritual maturity and thinking, this is a must read. Even the one who has it all together will find themselves in the pages of this book as Mr. MacDonald reveals our attitude problems. I can't think of a single person who couldn't grow spiritually by reading this book. It was humbling and challenging, while affirming in knowing we can do NOTHING without Christ. I appreciated the author's candor and connection he had with the reader. I came away with several new areas of focus and prayer for my life ~ all to grow closer in fellowship with my Savior. Love James MacDonald! This is a great book on our attitudes while going through hard things in our lives, a lot of references to the Israelites and their trek through the desert and how their journey sometimes mirrors our journeys as well. Very practical book, easily understood from a great teacher of God's word. Absolutely life changing, for our entire family. It would be hard to read this book and not be changed. We did it as a Bible study with the kids in the evenings and I saw changes in everyone. We all worked together to challenge one another. There was a thing or two we disagreed with but just an amazing work overall. James McDonald is one of my new favorite non-fiction authors. I highlighted the heck out of this book. There were lots of great explanations for Biblical background information. It was well-written. I can highly recommend this book. This was a life-changing book for me. I can't really say anything other than if you know in your heart that you have an attitude problem with complaining, criticism, coveting or rebelling, you need this book. James MacDonald (D. Min. Phoenix Seminary) is married to his high school sweetheart, Kathy, and both are from Ontario, Canada. He is the father of three grown children, a daughter-in-law, a son-in-law, and grandfather to four amazing grandsons. James’ ministry focuses on the unapologetic proclamation of God’s Word. In 1988, along with a small group of ministry partners, James and Kathy planted Har James MacDonald (D. Min. Phoenix Seminary) is married to his high school sweetheart, Kathy, and both are from Ontario, Canada. He is the father of three grown children, a daughter-in-law, a son-in-law, and grandfather to four amazing grandsons. James’ ministry focuses on the unapologetic proclamation of God’s Word. In 1988, along with a small group of ministry partners, James and Kathy planted Harvest Bible Chapel which has grown to 13,000 people each weekend, meeting in six locations. In 1997, a Bible-teaching broadcast ministry called Walk in the Word was established, now reaching more than three million people weekly. In 2002, a church planting ministry called Harvest Bible Fellowship was born and has established more than 70 churches across North America and around the world. James’ vision is that God will use him to help plant 1,000 churches in his lifetime. James’ extensive ministry also includes a training center for pastors, a year-round camp, a biblical counseling center, a disaster recovery organization, and a Christian school—all used to reach more people with the life-changing message of the Gospel.